Patra's Other Place: Christmas Day. We had a perfectly lovely day. Just Ken and I with one of his cousins, who was on her own this year due to her siblings being elsewhere, so we invited her to join us. I bought a turkey breast with bacon and sage stuffing at Coles and cooked that with the usual roast vegies. We followed that with a pot of tea and some Christmas cake. 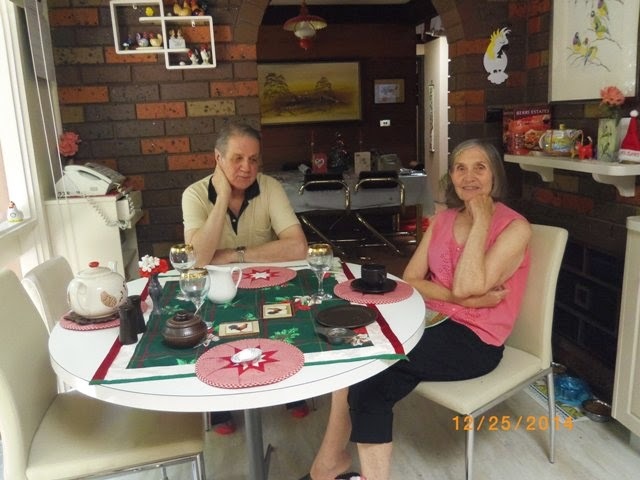 Here is Ken with cousin Ro, both of them pleasantly full of good food and apple cider! I was given some lovely gifts again this year. Ken gave me a GPS and a sapphire and diamond eternity ring. 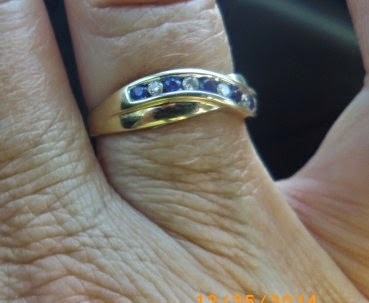 I suggested that he wait until our 36th anniversary on January 6th but he wanted to give it to me as soon as he bought it, so there we were in the Greensborough Centre having a coffee, while he put the ring on my finger! I felt like a teenager all over again, lol! Other gifts that I received were a chook calendar, chook garden ornament, Xmas apron, Peacock cushion, a plant, and various items of food. What a lovely Christmas present! Happy New Year to you and Ken.